Year 1805 (MDCCCV) was a common year starting on Tuesday (link will display the full calendar) of the Gregorian calendar (or a common year starting on Sunday of the 12-day slower Julian calendar). February 15 - Harmony Society officially formed. March 1 - Justice Samuel Chase is acquitted of impeachment charges by the U.S. Senate. March 4 - Thomas Jefferson sworn in as President of the United States, for second term. April 29 - Rutger Jan Schimmelpenninck is appointed as Grand Pensionary of the Batavian Republic by Napoleon. June 4 - The first Trooping the Colour ceremony at the Horse Guards Parade in London. June 13 - Lewis and Clark Expedition: Scouting ahead of the expedition, Meriwether Lewis and four companions sight the Great Falls of the Missouri River, confirming they are heading in the right direction. June 13: Lewis & Clark. October 17 - Napoleonic Wars: Battle of Ulm - Austrian General Mack von Leiberich is forced to surrender his entire army to Napoleon after being surrounded. October 21 - Napoleonic Wars: Battle of Trafalgar - British naval fleet led by Admiral Horatio Nelson defeats a combined French and Spanish fleet off the coast of Spain; however, Admiral Nelson is fatally shot. 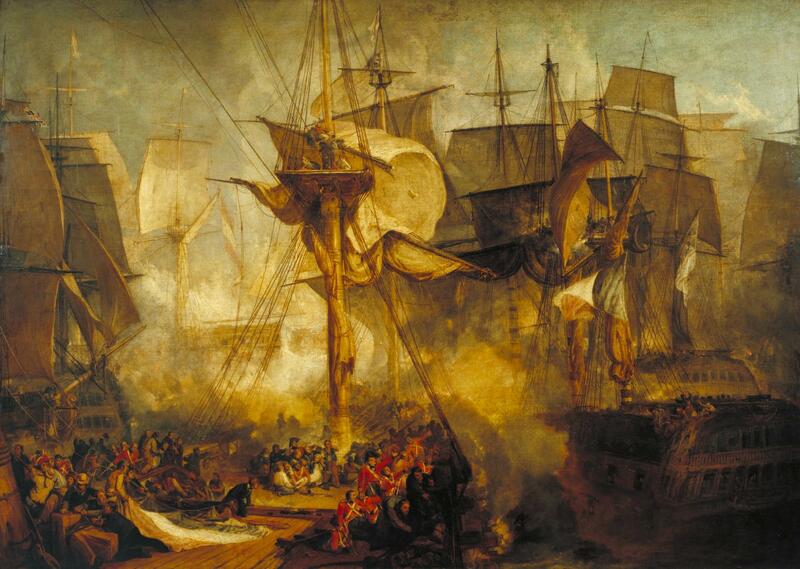 October 21: Battle of Trafalgar. December 2: Napoleon wins Battle of Austerlitz. November 7 - Lewis and Clark Expedition arrived at the Pacific Ocean. November 11 - Napoleonic Wars: Battle of Dürenstein - 8000 French troops attempt to slow the retreat of a vastly superior Russian and Austrian force. November 16 - Napoleonic Wars: Battle of Schöngrabern - Russian force under Pyotr BagrationBagration delay the pursuit by French troops under Murat. November 26 - The Pontcysyllte Aqueduct is opened. December 26 - Peace of Pressburg between France and Austria. James Squire became the first person in Australia to cultivate Hops. Horse Patrol, mounted law enforcement force, is founded in London, England. Napoleon annuls the ten-day week of the French Revolutionary Calendar. He also orders his soldiers to be vaccinated. 86 people were married in 1805. There were 1 military battles in 1805. This page uses content from the English language Wikipedia. The original content was at 1805. The list of authors can be seen in the page history. As with this Familypedia wiki, the content of Wikipedia is available under the Creative Commons License.